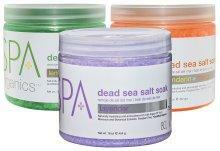 Dead Sea Salt Soak cleanses and prepares the hands, feet and body for the spa treatment. Naturally hydrating and antioxidant-rich with Argan Oil from Morocco and Botanical Extracts. Paraben Free. Certified Organic. Sugar Scrub gently exfoliates and moisturizes the skin, leaving it soft and silky. Naturally hydrating and antioxidant-rich with Argan Oil from Morocco and Botanical Extracts. Paraben Free. Certified Organic. 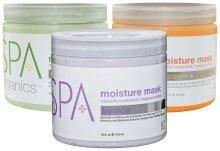 Moisture Mask restores skin's natural hydration and deeply nourishes the skin. Naturally hydrating and antioxidant-rich with Argan Oil from Morocco and Botanical Extracts. Paraben Free. Certified Organic. Massage Cream heals, conditions and regenerates the skin, leaving it smooth and hydrated. Naturally hydrating and antioxidant-rich with Argan Oil from Morocco and Botanical Extracts. Paraben Free. Certified Organic. This lightweight gel lotion with dry touch technology restores your skin to silky smoothness with lightweight, instant, invisible absorption which dries in less than 2 minutes for 24 hours of moisturization. Dry instantly to the touch. Naturally hydrating and antioxidant-rich with Argan Oil from Morocco and Botanical Extracts. Paraben Free. Certified Organic. This non-greasy, easily absorbed massage oil provides an experience of total relaxation as it soothes away the stresses and tensions of the day. Naturally hydrating and antioxidant-rich with Argan Oil from Morocco and Botanical Extracts. Paraben Free. Certified Organic. An ultra-mild hand soak and cleanser with a revitalizing citrus scent. Effectively cleans hands and hydrates skin. Ultra mild for all skin types. Adds a fresh citrus scent and light lacy foam to water. 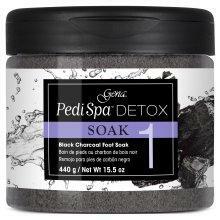 A concentrated seaweed foot soak with a fresh fragrance and a light, lacy foam that cleanses and softens. 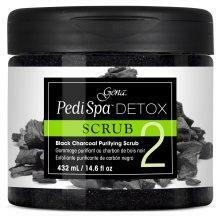 Cleans feet and hydrates skin. Produces a light, lacy foam when gently agitated. Leaves no residue in footbath. 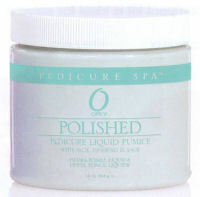 A rich, silky gel which cools, relaxes and soothes tired, achy feet and legs. Provides an instant, cooling sensation to skin. Hydrates and softens. Acts as an astringent. Absorbs into skin for fast action and quick relief. Powder finish, leaves no sticky residue. Can be used anytime, anywhere. A cooling, rejuvenating foot masque enhanced with hydrating sea extracts, conditioning mineral clay and soothing botanicals. Cools the feet with natural menthol. Draws moisture into the skin with Panthenol. Helps calm inflammation and irritation. Leaves feet refreshed long after the pedicure is complete. Provides the aroma-therapeutic benefits of natural Spearmint Oil. 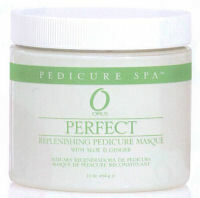 Provides a "facial-like" treatment for the feet. An oil-free massage formula that leaves feet feeling silky smooth and soft. Lubricates skin for an effective massage with a non-oily feel. Contains moisture binding agents to deeply hydrate skin. Water-solubility allows for easy removal. Leaves skin with a silkened finish. Non-staining. Universally appealing fragrance. 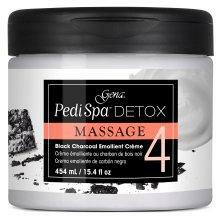 A conditioning volcanic clay foot masque fortified with a rich blend of hydrating and protective vitamins and minerals. Volcanic clay delivers vitamins, minerals and moisturizing agents deep into the skin. Moisturizes, aids in fighting free radicals and helps improve elasticity with vitamins A, E, panthenol (pro vitamin B5) and evening primrose oil. Helps protect skin against environmental stress with rhodochrosite stone extract and grape seed extract. Deeply conditions and helps protect skin. Silky texture allows for ease of application and removal. Relaxes and comforts with aroma-therapeutic ginger, patchouli and clove bud. A hydrating massage lotion filled with vitamins and minerals that shields the skin with a satin finish. Ceramide 3 complex: protects skin with water-resistance, leaves a satin finish, provides smooth glide for massage. Helps protect skin against environmental stress with smithsonite stone extract, grape seed extract and vitamins. Offers lasting moisturization. Allows for an effortless massage. Provides an aromatherapeutic experience with natural orange flower, ginger and davana oils. A super-concentrated alpha-hydroxy acid serum for breaking down tough calluses. Twenty percent alpha-hydroxy acid complex breaks the bonds between dead skin cells in tough calluses. Seaweed Polysaccharides counterbalance the potential irritative effects of A.H.A.'s. Regular use helps inhibit the development of calluses over time. Thick formula allows for safe, controlled application. 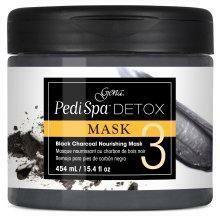 Exfoliates and refines using pumice. Moisturizes the feet with aloe, eucalyptus and lavender. Naturally clay-based and fortified with aloe and ginger to tone and moisturize.